Leaving the boatyard at Weesp (near Amsterdam) we headed north east using the Gooimeer and Eemmeer, dropping anchor for a night in Veluwemeer, one of the many lakes. 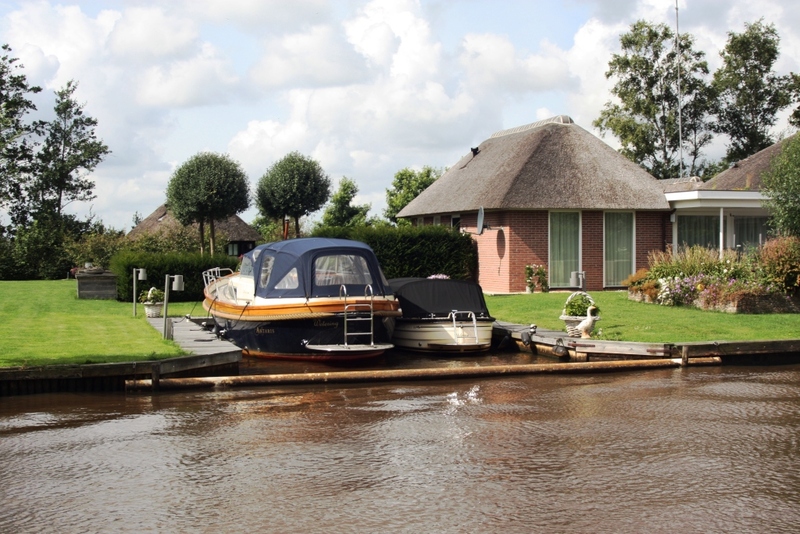 From Veluwemeer we used the Hoge Vaart canal on Flevoland to cut across to Ketelmeer and along the Ramsdiep then off onto a string of small canals for a tour of some beautiful towns of the Overijssel region (just south of Friesland) starting with Vollenhove. Ossenzijl was as far north as we travelled, from there we headed along the Steenwijk Ossenzijl canal through the unique town of Giethoorn, via the Zwarte Water into the Gelderse Ijssel river, pushing against the out-flowing current. We are now constantly going uphill! We have gone from more than five metres below sea level through the Flevoland canal, to steadily climb our way up out of the Netherlands heading back to Paris. 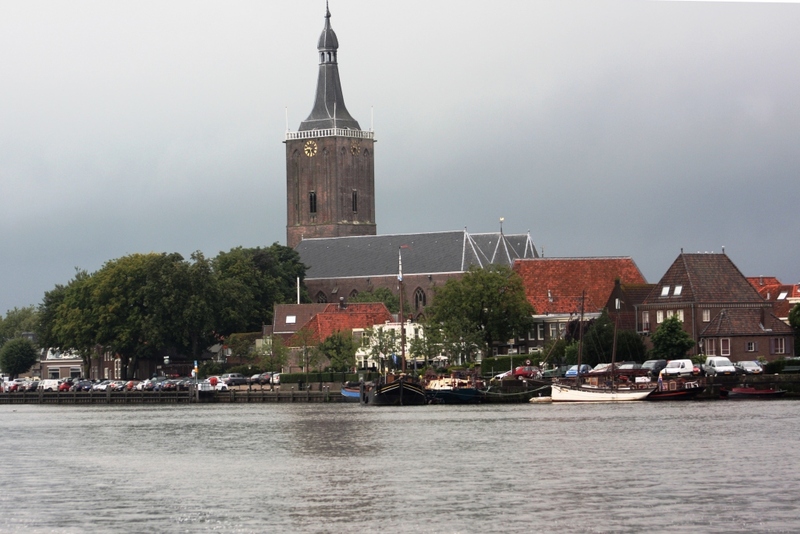 When we arrived in Weesp for our now annual modification and maintenance schedule we found quite a few business changes. Happily Marco de Bruyn and his team were doing very well, increasing their headcount and ready for our huge list of tasks. Next door, where we used the travel crane last year and hoped to use it again, the ownership, in the hands of Bart who now ran the yard, had changed but luckily we still found Karel and his brother Art (and his dog) ready to assist us. Endellion with a beautiful black bottom, this time including anti-foul. The biggest challenge for us was our paintwork (again), this time it was the blacking, or the anti-foul treatment. The painter of our roof (in 2011) had also painted the bottom but unbeknownst to us hadn’t used any anti-foul so we had grown quite a garden which, as we mentioned before, the ducks love but it slows us down and costs us fuel apart from looking bad. The painter and his completely absent friend the ‘professional shipwright’ made sure they were no longer available to address this issue (“on holiday”) and so all we could do was have the boat lifted again and repaint the bottom, this time with anti-foul. The only person we’d trust to do it was Marco who then worked with the neighbouring boat yard (Marco’s crane can’t lift our 37 tonnes). Our neighbours for a few days were entertaining and well-behaved, despite the beer crates and weed. Before we left Weesp we had almost completed our huge list of tasks, only a few things are now at the top of the list for 2013; like sound-proofing and heat retarding work for our engine hold. We had a few entertaining days on board during the week up in the air (remembering Stewart couldn’t get off during this period) .. like watching the marijuana growers who sat beneath our stern end when we were still in the slings of the crane for two days. They were very amusing in their love of music, beer and nurturing their spindly green plants which they moved from stern to roof to quay and back in frequent admiration. The sculpture being saved by the good Samaritan bailing out the dinghy, artist sits in appreciation. I managed to stumble when on our small bow area stowing away paint pots into the chain locker and fell gashing my lower arm on an uncut bolt that was holding the flag mast into place. This meant a visit to the doctor (our local) who was quick and efficient as we’ve found throughout the Netherlands to date, sewing in five nice stitches and sending me on my way. We had a beautiful last evening spent in town, Stewart finally getting off the boat, at our favourite restaurant ‘Minevitus’, sitting on the edge of the tiny canal where there is a sculpture. Last year at this same spot there was an Italian-style character with red and white striped top sitting in a little dinghy. This year the same dinghy was in use but this time inside it was perched a new sculpture, a man with a penny whistle in his hand and a big snake behind him looking like it was going to bite him! What drew us to the sculpture was that a man with a little rubber ducky had moored to the side of the man in the boat and we diners were all a bit shocked that he would do such a thing: Tie your boat to what was obviously a work of art. However, as we sat and watched eating our delicious main course we saw a woman approach him carrying a big bucket. 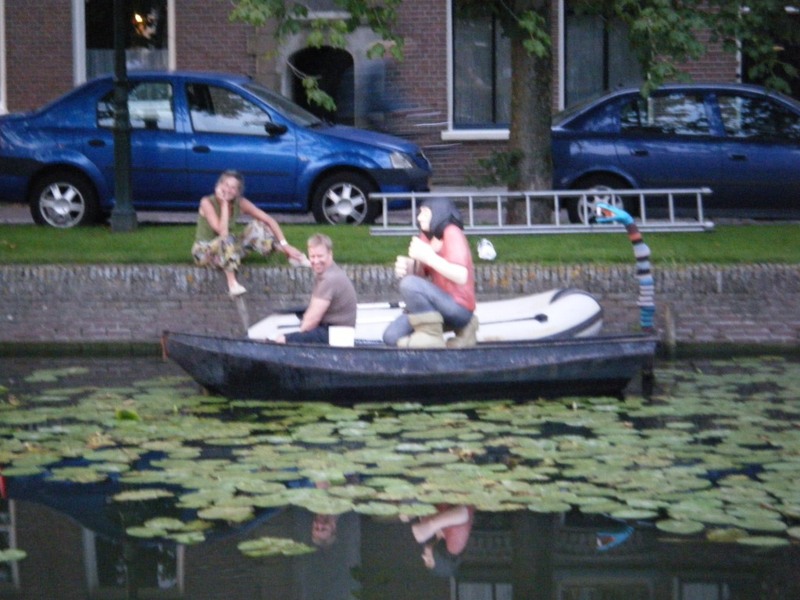 We thought she was abusing him .. but in fact she handed him the big bucket and the man started bailing out the dinghy. With great relief we diners shared in the good Samaritan character of the man assisting the artist in saving her man in the boat .. it had been torrential rain for some days and it was quite obvious to us the boat would have sunk with a few more days rain. 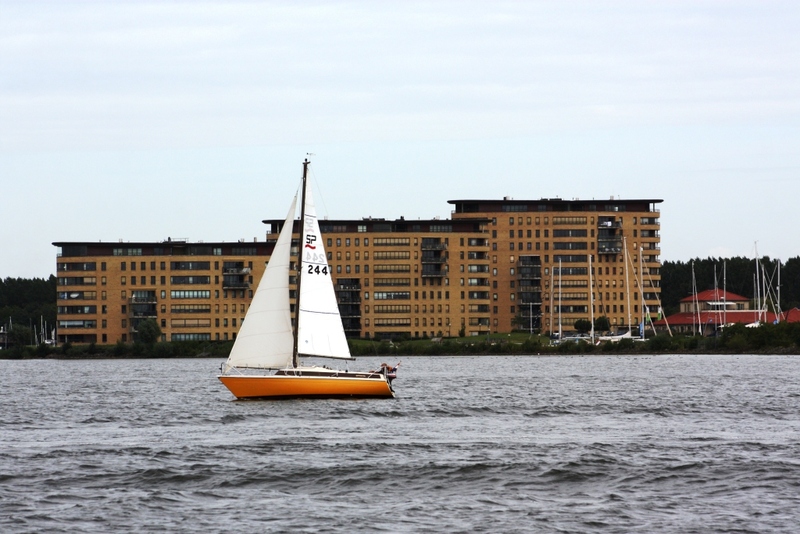 Making our way from Weesp with Flevoland to our left, modern buildings abound. 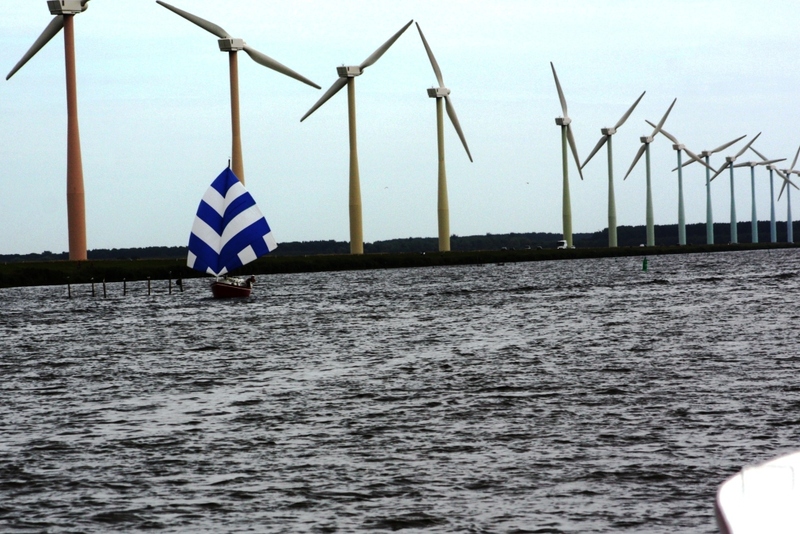 Wind turbines and sail, a common sight along this waterway. When we finally left the boatyard of Marco de Bruyn, very happy with all the work he and team had done, we headed out on a big run trying to make up for lost time (two weeks in a boat yard with one week when Stewart couldn’t disembark as we were stuck on land). Our first night of freedom was as big a contrast as could be imagined. After a reasonably long day (around 60 kilometres, described in the first bullet point above) we arrived a little later than anticipated (soon after 6.00pm) at the marina at a place called Horst (thinking of Annette) and everything was closed up. Stewart lapping up the open air, no land (like our time in Weesp) but absolutely no complaints: floating on anchor for the night. However, we could see a nice available pontoon just right for our length and pulled in to discover this was the fuel wharf. The sign on the window said open tomorrow at 8.30am and as we needed fuel we thought, perfect, we can stay and fuel up first thing. However, around 30 minutes later a very angry, red-faced man appeared and started yelling abuse. We asked if he could repeat this in English which he did. He had been moored up waiting for us to move so he could fuel up .. it was an automatic system so it was virtually a 24 hours facility. OK, we had no problem and took our leave turning out of port and away into the lake just outside. Sunset on the lake where we dropped anchor. 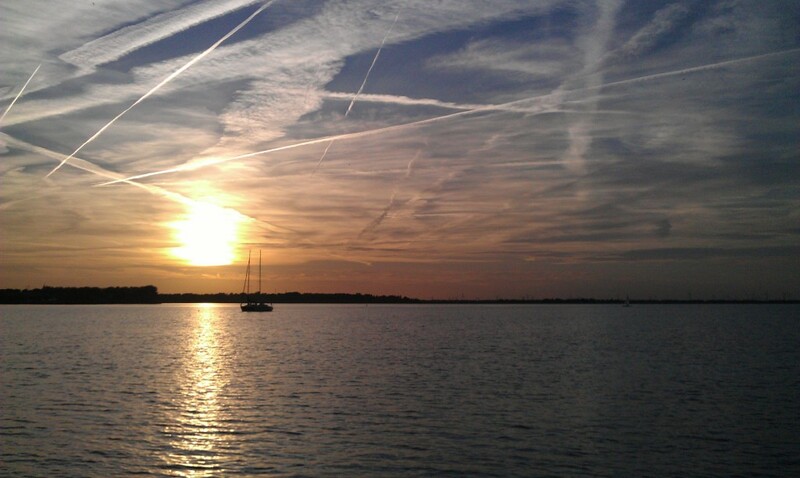 It was a beautiful evening, warm, sunny and tranquil once outside of the port and away from angry skippers. We dropped anchor just 10 minutes further on off De Zegge island. This man did us a huge favour forcing us to make the best decision: To spend the night floating on our anchor. We worried for a while whether it would hold .. but yes it did, and we were in the same spot when we woke up in the morning! Following the small power boat with father and son who squeezed into the 20 metre lock with us. This was the start of a week of blissful towns and charming waterways. 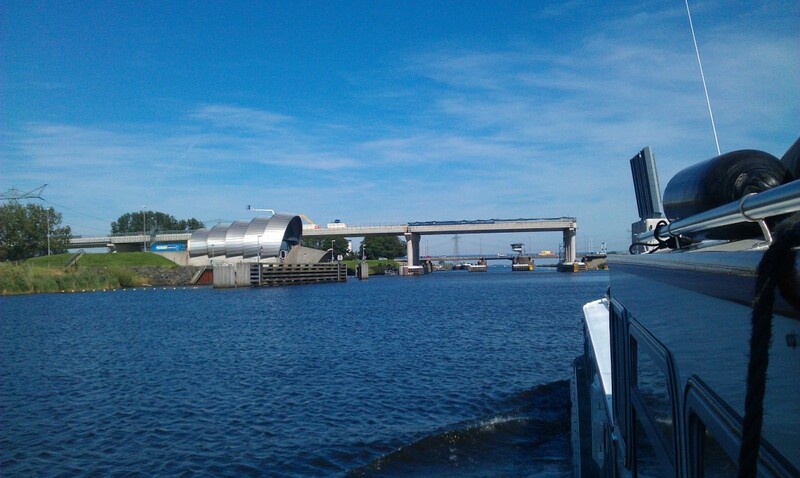 Once we’d pulled up anchor and headed off we decided to pass through another, man-made island, Flevoland, which we’d visited during our time in Weesp by train (coming up Stewart’s story of Flevoland/Canberra). 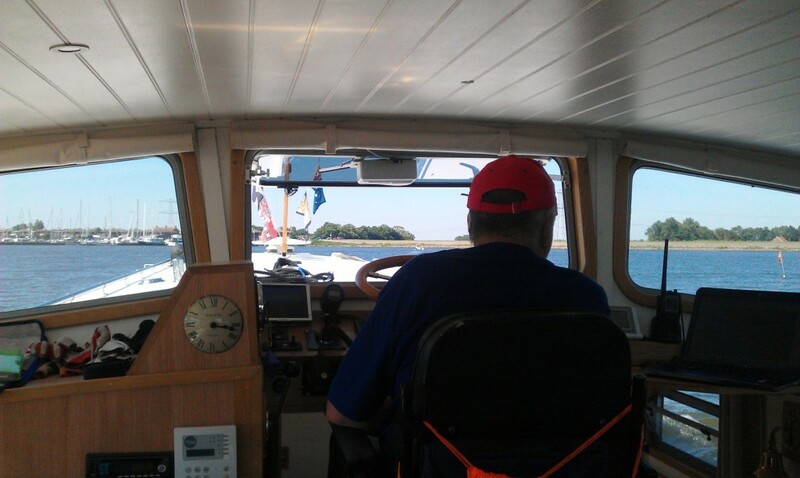 We entered the small canal from Veluwemeer and waited behind a small power boat for the lock to be available. The lock keeper asked how long we were .. 17 metres (the lock was 20 metres long). You will have to let the little boat go in first, and he will then go diagonally across the lock and if there’s room you can come in behind, he told us. It took almost twenty minutes to get the two boats jammed inside so the lock gates could be closed. We’re going down five metres he reminded us: Taking us more than five metres below sea level. The skipper of the speed-boat and his son were not very happy when I thanked them for sharing the lock, “He told us to”, dad reminded me. But by the end of the process, as we bobbed closely together but didn’t touch, the two of them relaxed and smiled and waved a happy goodbye to us as they roared through the open gates. 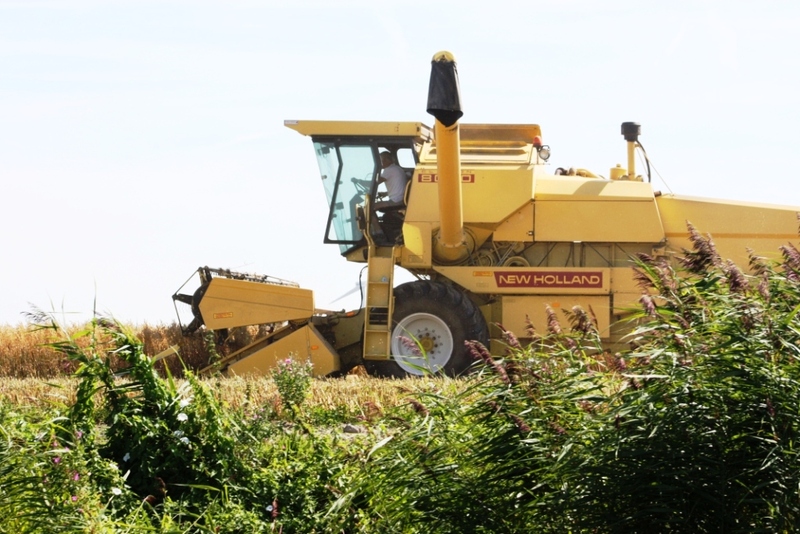 Harvesting in Flevoland, the farmer gave us a big wave. He wouldn’t have seen many boats our size along here. 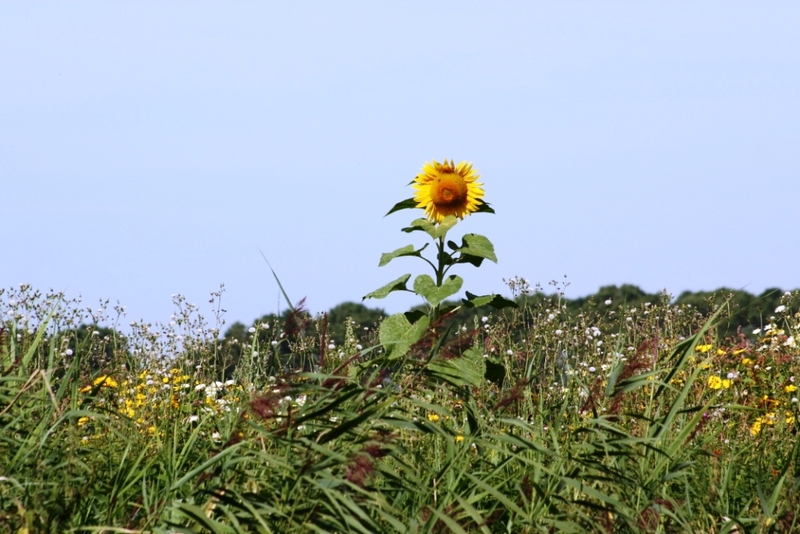 Gorgeous sunflower looks up, along the Hoge Vaart, Flevoland. The weather became very warm, at last we had summer. But as the day progressed it became too hot .. reaching well over 30 degrees centigrade as we pushed on to get to our mooring with electricity for the air conditioning. Finally we arrived late in the afternoon at the lovely town of Vollenhove and were greeted by the very helpful harbourmaster, Rob, and directed into a safe place for the night. We didn’t need anything more than electricity and the cool blast of our now working air conditioning (one of the jobs fixed by Marco de Bruyn and team). Stewart on the big hot day, coming out through the Ketelmeer lock. Beautiful water, blue sky .. and hot. Arriving at Vollenhove marina, the beaitufl lift bridge stands ready. We’d arrived at the beginning of their week of festivities which explained all the bunting and flags flying along many of the streets, each with a different theme, mirrors’ in one street and then ‘tea party’ in another. 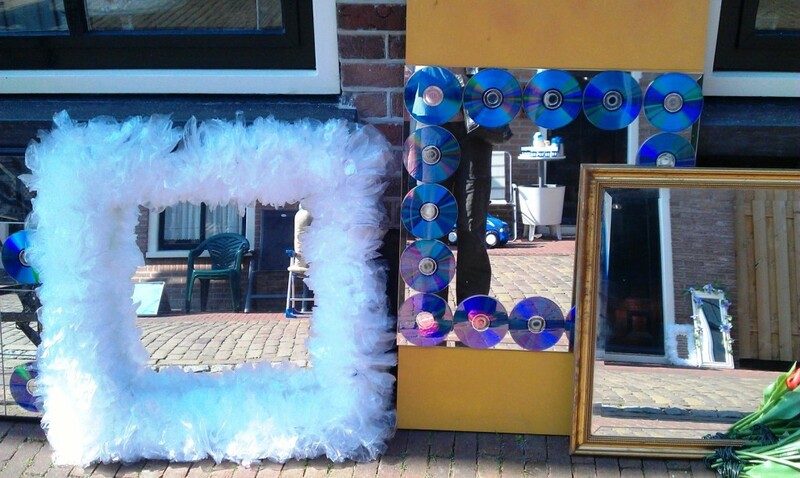 Mirrors, ready to display in the street festival. The street of ‘tea parties’. 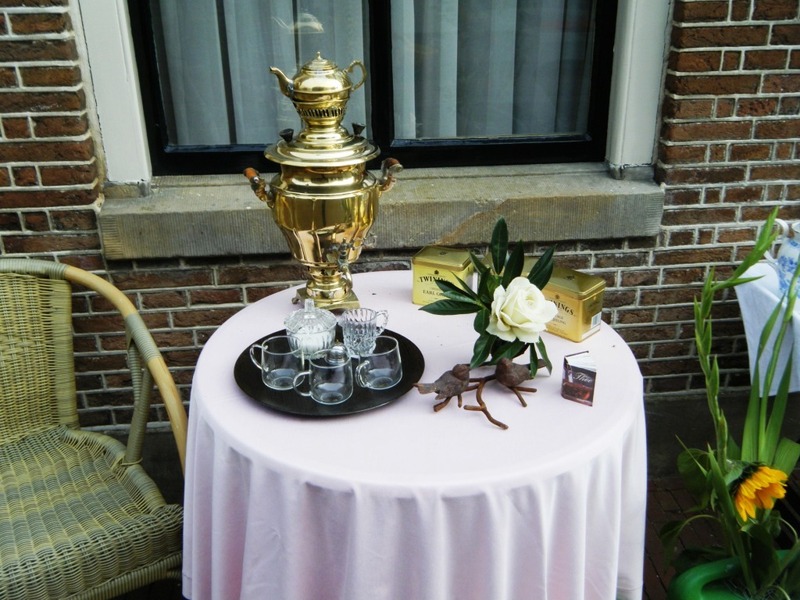 One of the fabulous ‘tea party’ displays in the Vollenhove festival. When it was cool enough we ventured out for a snack at a nearby cafe, sitting at the foot of the church. 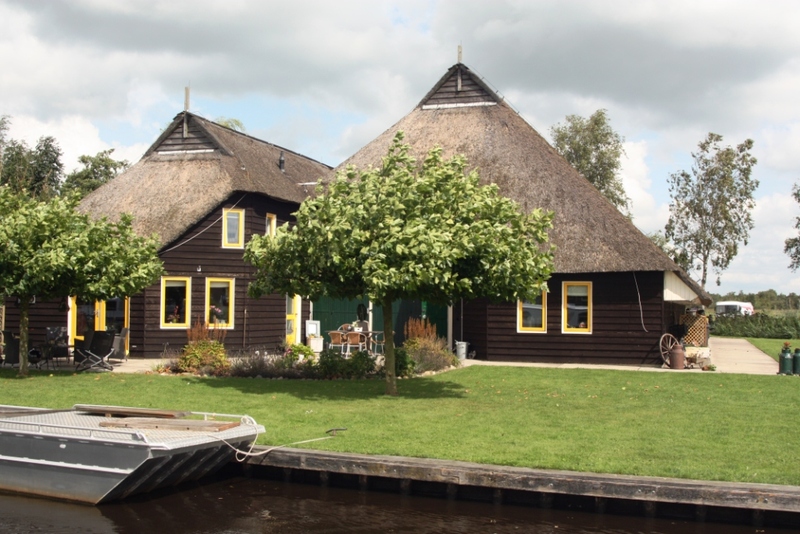 On one side of us our neighbours were retired dairy farmers from near Gouda, and on the other side we met a food technologist and his partner who had a tea room at Giethoorn which we were to visit later in the week. We had a six-way conversation as we munched our way through our meal. Exchanging views on the future of dairy farming across Europe and comparing farming in general with that in Australia – the same subject covered in depth in the BBC program ‘Country File’ which we’d watched only the night before. 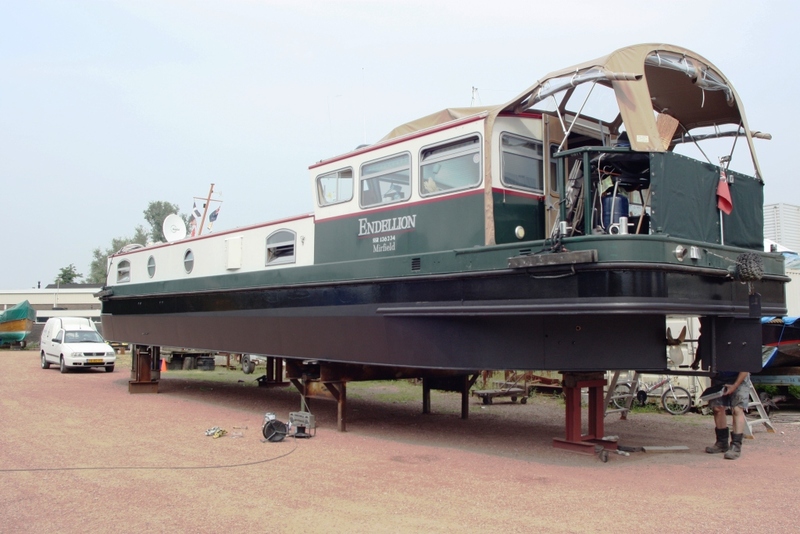 Endellion finally moored at an accessible pontoon in Blokzijl. 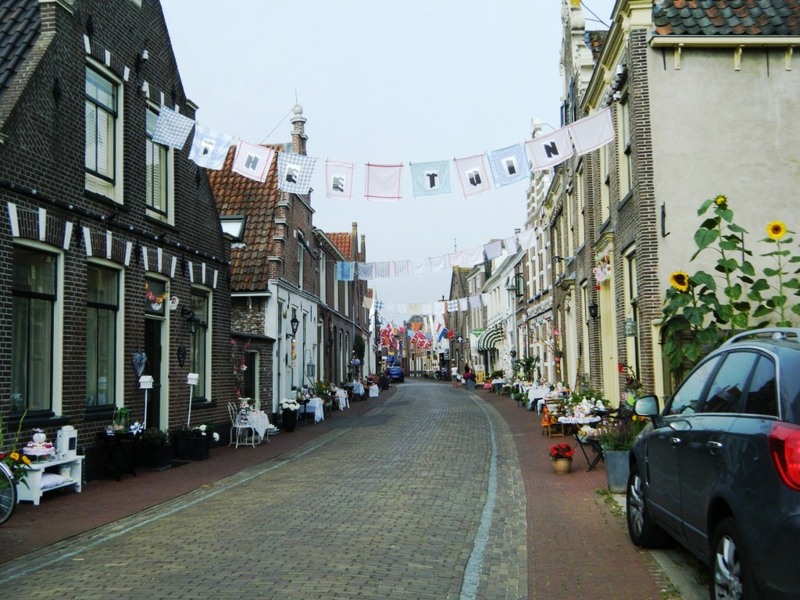 We pottered on up to Blokzijl, a small and charming town built around the harbour. Rob, our Vollenhove harbourmaster, had in theory arranged a mooring for us, now fully appreciating what ‘wheelchair access’ means, ie, no steps or steep jetties. Unfortunately when we arrived at Blokzijl we were told to moor alongside the long concrete jetty which was way too high to put a ramp against, so Stewart was locked on board. However, earlier Rob had used this marina’s internet webcam to advise them on where he thought we should moor to have access. When we arrived another boat was in that place but we think Rob must have followed our progress over the internet as a while later one of the harbourmasters came on board and by early afternoon the boat who’d somehow taken over ‘our’ place happily moved on with a wave and so we could take our wheelchair accessible place. Thatched roofs of old farm houses. Very smart thatched houses abound in this area. 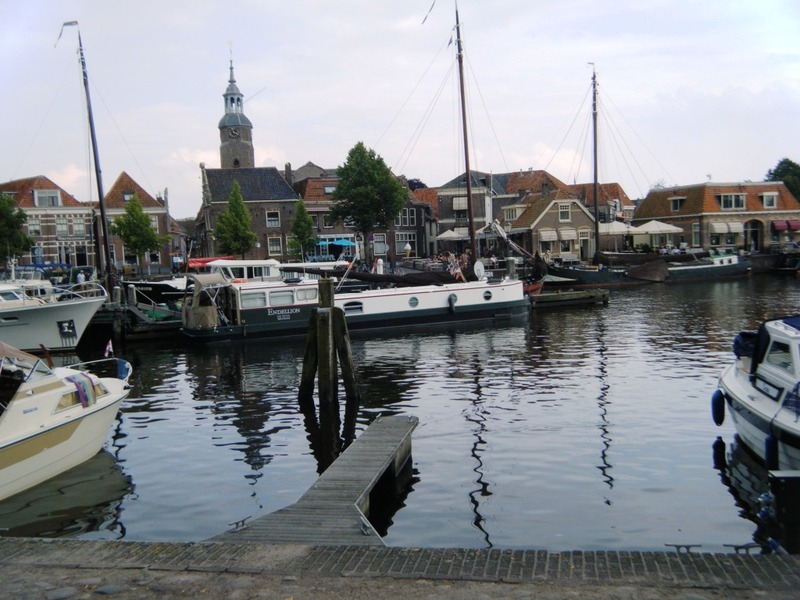 Like Haarlem, where we had a designated wheelchair accessible place we were amazed to find other public moorings designed specifically for wheelchair users. 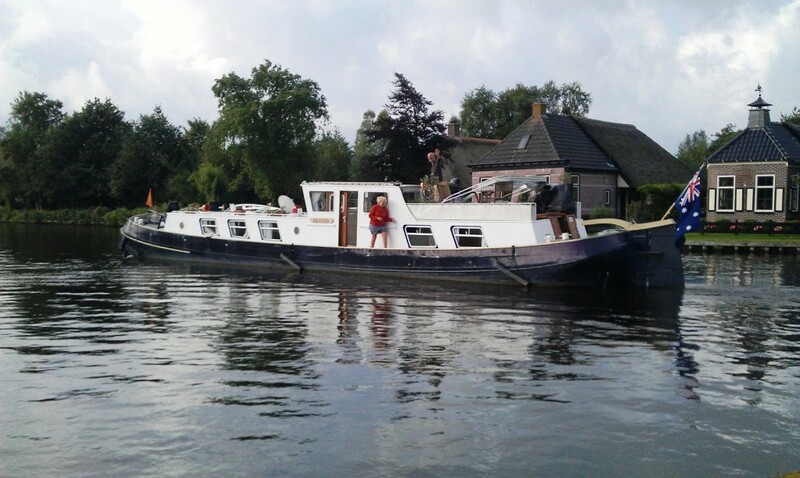 Although Blokzijl didn’t have such a place, they went out of their way to help us with a suitable mooring. 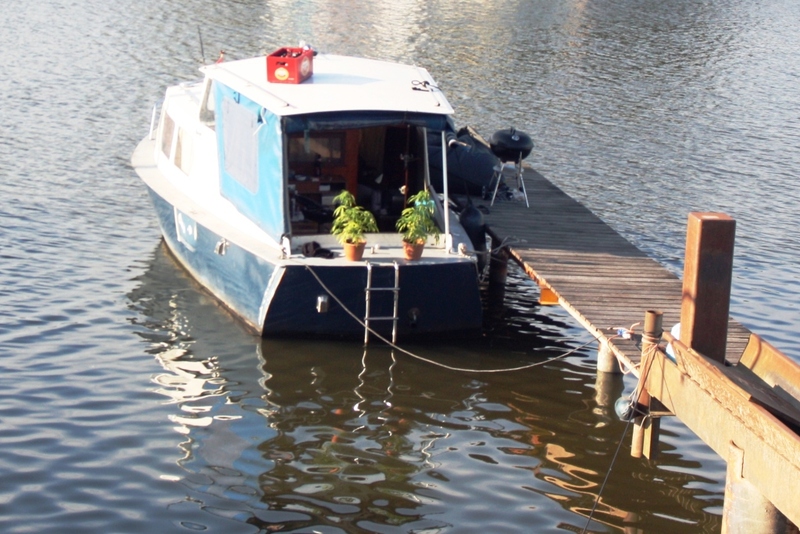 Wheelchair accessible moorings provided with three different levels to suit just about any boat. On again the next day heading to meet up with our friends John and Lesley. However we experience one or two of those heart in the mouth moments on the journey of only fifteen kilometres. The canals were by now narrowing and had more sharp bends than of late. This wasn’t a problem, our challenge was arriving at a tiny lift bridge which stubbornly was closed for lunch and wasn’t going to open for another fifteen minutes. This might seem nothing, but we’d just passed a long line of small cruise boats lining the narrow canal on both sides and as we arrived at the head of the queue we found absolutely nowhere to tie off. It was a windy day, we’d mistakenly jumped the queue of small boats and now sat like a great elephant in amongst a cage of amiable lions. It was a fish-bowl experience as we were facing a restaurant on the edge of the bridge where the customers were all staring at us from their tables on the little deck. I scrambled into the bushes of an overgrown garden beside us and held a mooring rope to try to steady Endellion, there were certainly no bollards to tie to. A few minutes later a man appeared peeping through the overgrowth from his side trying to speak to Stewart through the open window. I asked if he could speak in English as we couldn’t understand Dutch. For the second time in a few days we wished we hadn’t asked to have things said in English as he crossly expressed we had to move, we were not allowed to stop here, “it’s forbidden”. I explained there was no way we could reverse back through the tiny channel with boats on both sides and the bridge was closed so we couldn’t go forward. This made no difference to him, he was not happy but we were not budging. You can’t stop here you are not allowed, he frothed. We sat it out as he tried to stare us down. Five minutes later he reappeared through the bushes holding his telephone and making it obvious he was taking our boat details. We said to each other, bring it on.. if he calls the police, no problem! Immaculate gardens and houses with the most common sight around here, a thatched roof. Every house has a major boat ‘marina’ of their own. A few minutes later we saw action at the bridge, a small dinghy with a floating barge attached was jumping the head of the queue on the upstream side, on the barge was a tractor. The driver of the dinghy looked completely out of control but managed to stop just under the bridge .. it being too low for him to pass through with his tractor. The lift bridge operator then came back on duty, the bridge lifted and the out-of-control dinghy with a totally wayward tractor on a barge came hurtling towards us. Get out of the way the dinghy driver and the lift operator said to us.. but where were we supposed to go! A very kind restaurant customer came and assisted as we got closer to their flimsy deck, the tractor barge gave us a hefty whack in the bow cushioned by the black inflated fender I’d held up, burst the fender and passed on the row of moored and waiting boats with gasps and the occasional shriek as he whacked into yet another boat. Finally we were through the bridge, once the long trail of boats came downstream behind the tractor, and no-one shook their fist at us for accidentally jumping the queue. In fact they seemed very kind and sympathetic, or perhaps they were just happy to have the entertainment of the elephant-sized Endellion and an out-of-control tractor. 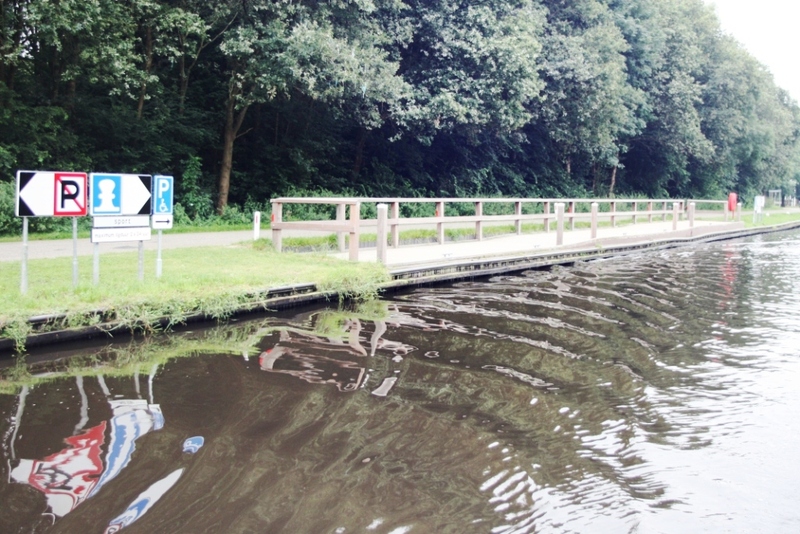 Not much further along the canal, once most of the cruisers had overtaken us, we saw John and Lesley standing on the banks at the entrance of the Ossenzijl marina, waving to us. What a delight. With great relief we moored off just in front of them on the grassy banks of the lovely marina. John and Lesley on board Emanuel head off the way we have just come: south towards Blokzijl. 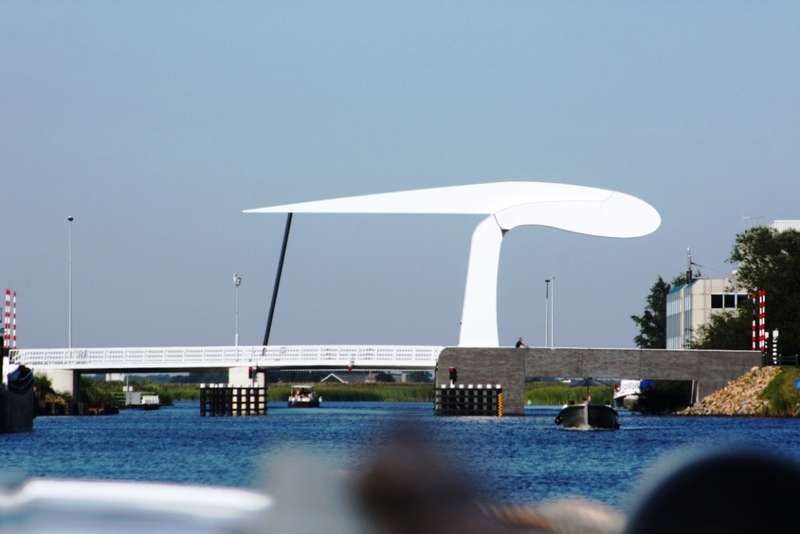 The Ossenzijl marina, like Blokzijl, is right in the heart of the national park of Weerribben-Wieden. 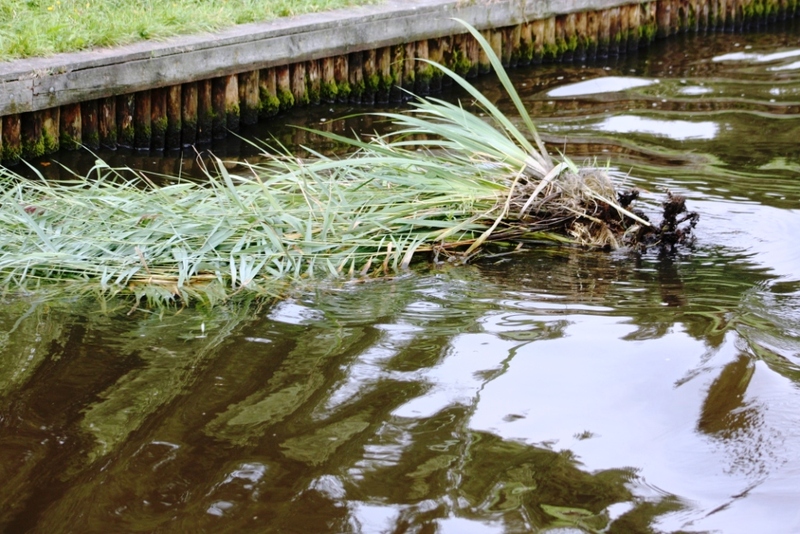 Everywhere there are lakes connected by canals and large sections of restricted water and land reserved for wildlife. They call this area in the northwest of Overijssel, ‘Kraggen’ (floating islands of cane) and ‘Trilveen’ (bog resting on water).. very colourful descriptions. Everyone around us in the marina was either holidaying in their boat, tent, caravan or campervan. It was teaming with families revelling in good weather and happy to be sleeping with a bit of canvas or thin plastic wall between them and squillions of others. It was a very happy holiday park. Floating island, perhaps, of cane. 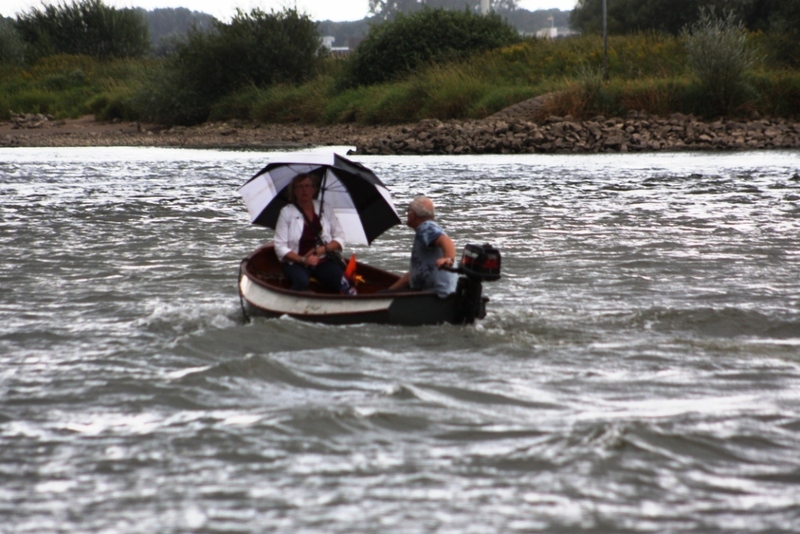 It was very strange to see John and Lesley with their boat Emanuel outside of Paris. 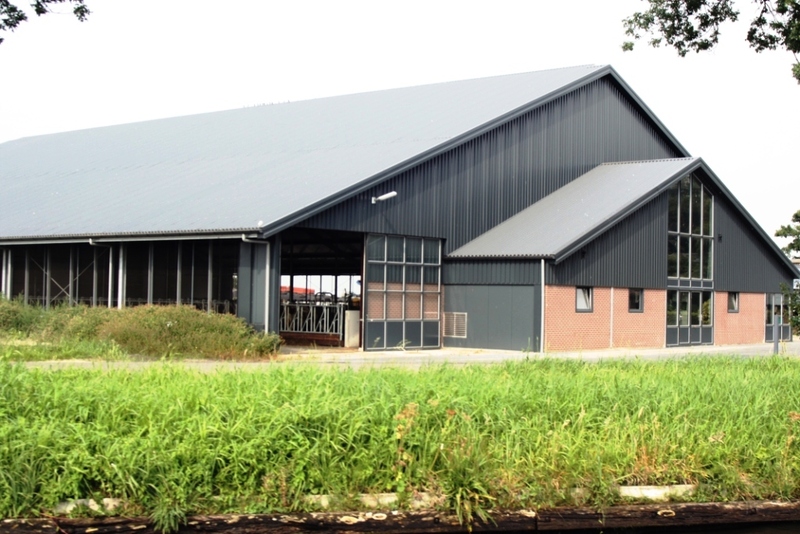 Like us they’d had major maintenance and repairs made in their favourite boatyard in the Netherlands. We’d only ever spent time together in the Arsenal marina in Paris during the last two winters. It was pure coincidence we were still both in this particular area of Europe after leaving Paris and so you can imagine we had lots to talk about, chiefly about our adventures on board both Es (Endellion and Emanuel), the work we’d had done, places we’d seen and of course families and friends. Vast acres of dairy-farming in this area but this is one of the smartest and largest milking sheds we’ve ever seen, complete with glass windows throughout. Then we went our separate ways, getting ever further apart for the next few days and then heading on different routes back into Paris for the winter. 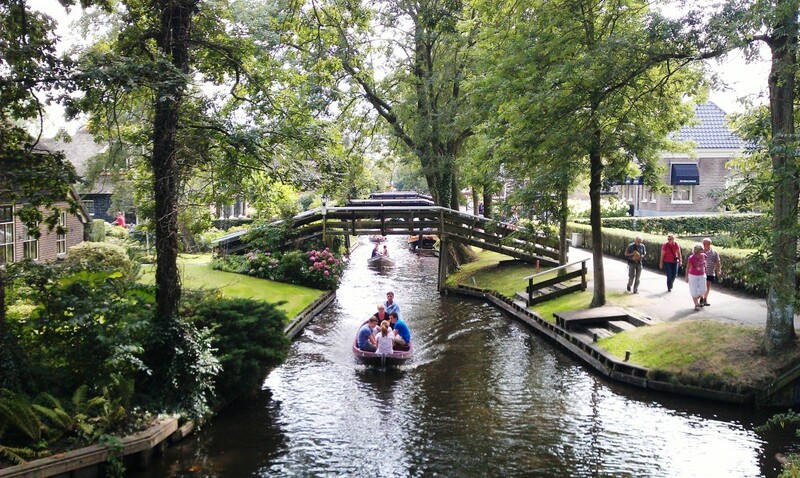 We next headed into Giethoorn, an amazing town described in their brochure as the Green Venice. We chuckled at this description, but when we saw for our own eyes the labyrinth of waterways running between each small thatched house with little wooden bridges up and down crisscrossing the canal .. we thought, not such a bad description. 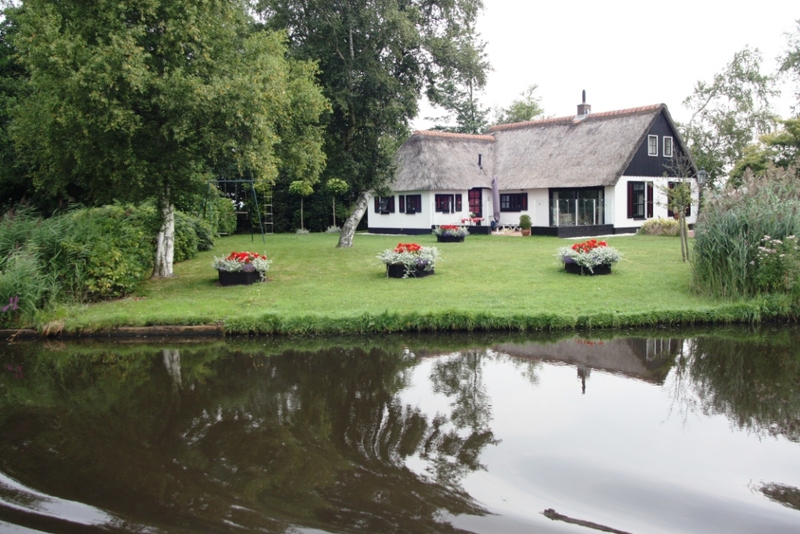 The exquisite canals of Giethoorn. 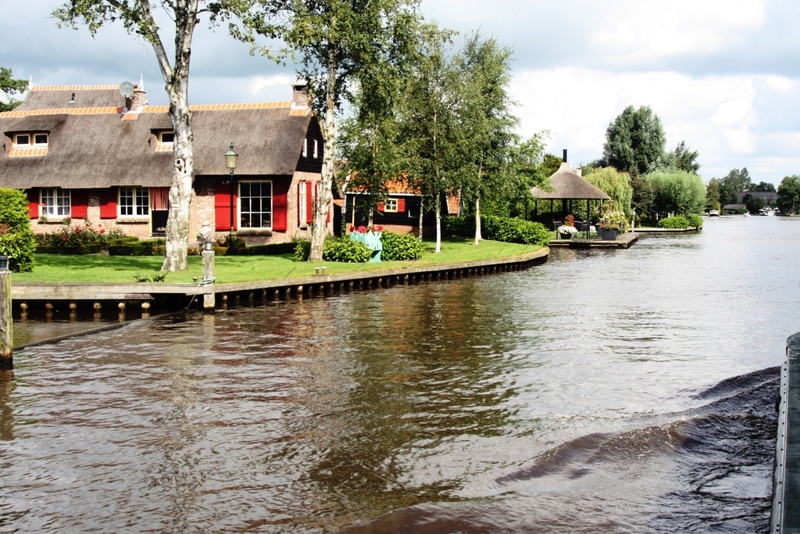 The ‘streets’ of Giethoorn are of water, everyone has to use a boat to get around. Stupidly it wasn’t until we’d left Giethoorn we remembered this was the town we should have visited our friends from Vollenhove, Pim and his partner with the Tea Garden. We will be in touch. 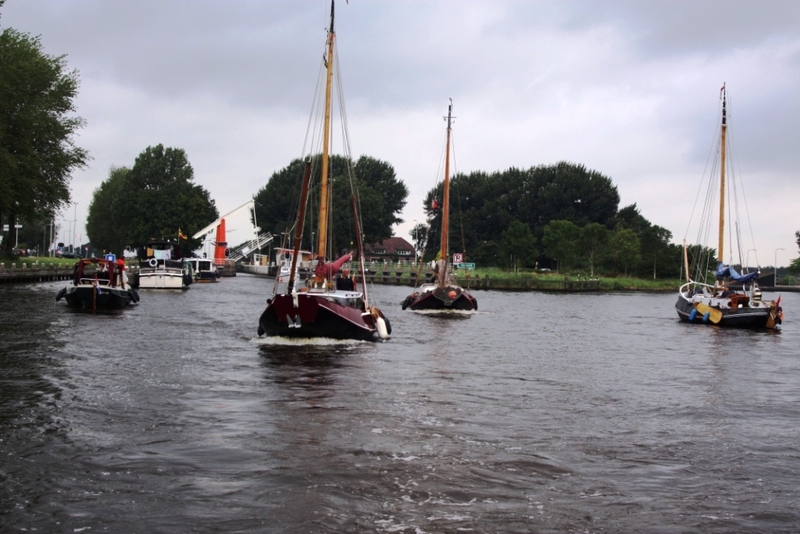 Coming off the small canals of Overijssel we are now in broader waterways heading south. The waterways were getting bigger and more commercial once again and when we arrived at the town of Hasselt, on the Zwarte Water, we found a much less pretty and tourist-oriented town than of late. However, here they were also celebrating summer with a festival and had a similar theme for their streets, eg, tea party, or music. 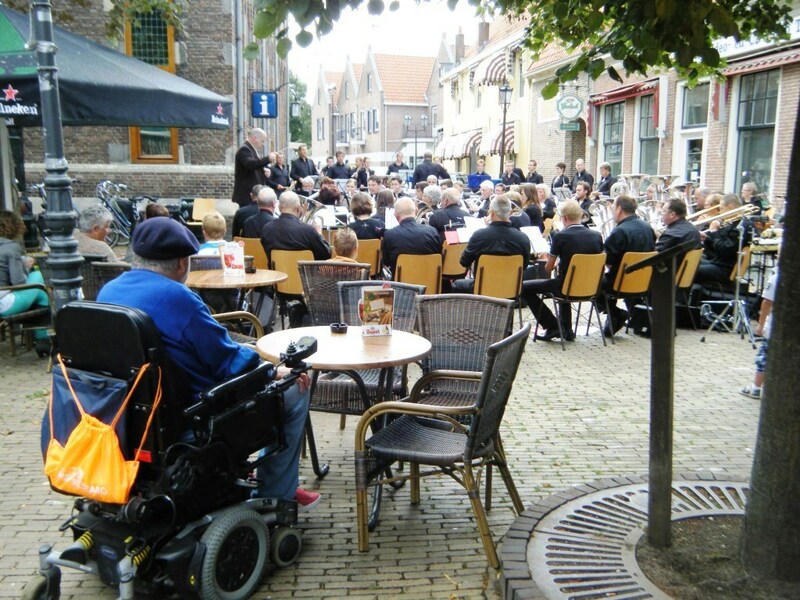 We were delighted that we’d arrived for their event with a huge 50 plus member band opening the festival week with a one hour performance outside in the main square. Nearby we found our internet connection at one of the few busy eateries in town, busy with locals with a good excuse to celebrate and be merry. The 50 plus member band at Hasselt. 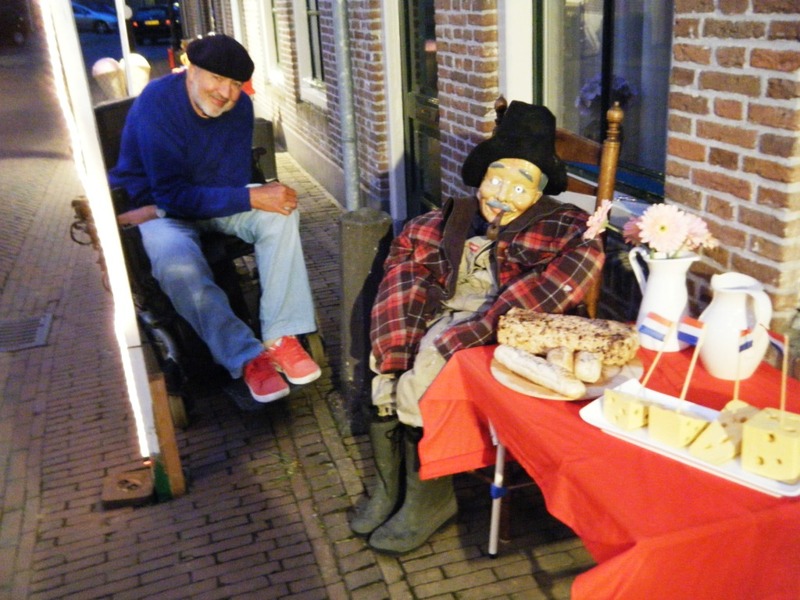 Stewart tries to engage the man with the cheese and wine table, street display for the festival. They told us later they would have a rock band, perhaps from 9.00pm, and we agreed we’d be back to join in. When we returned later, the pub was still going strongly but no band .. the locals explained that ‘he’ (the owner) couldn’t remember whether he’d booked the band or not and so couldn’t book another just in case two turned up! There was this slightly disorganised feel to this eatery with internet connection .. and we were made to feel very welcome. Leaving the quayside at Hesselt behind us, stormy skies. This was almost the last of the leisurely, site-seeing days for a while. We’re now heading upriver on the Gelderse Ijssel which flows quite briskly. We’ve tracked a few commercials (despite the first day being a Sunday and perhaps a day off for them) displaying their blue boards, expecting fellow-boaters to change channels for a particular bend. 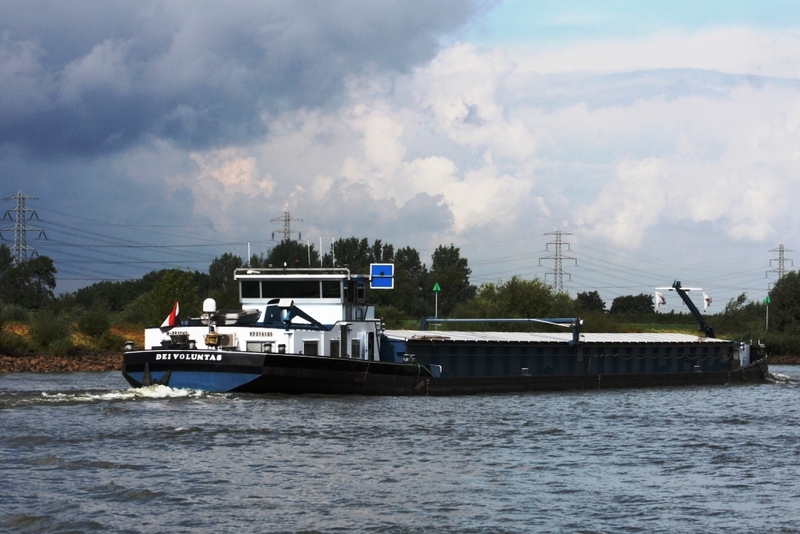 Stormy skies and similar waters of the Ijssel, many passing commercial barges use the ‘Blue Board’. We’ve been hit by a huge rain storm where visibility was down to only a hundred metres or so .. and we’re hoping the rain doesn’t bring an increase in flow here or further along the waterway. Then again, as we progressed uphill (so to speak) against an increasingly strong flow (easily four kilometres an hour), we realised just how low the river was (thank goodness for our new Steyr motor). Its source would appear to be from the River Rijn in Germany where there are significant drought conditions according to recent farming reports. A very brave couple make their way home ahead of the storm. We’re about to end this section of river (Ijssel) and take on a section of the Waal (also coming from the Rijn). Wish us luck.. this is a big windy section of very fast flowing river and this time we will be going down with the current. 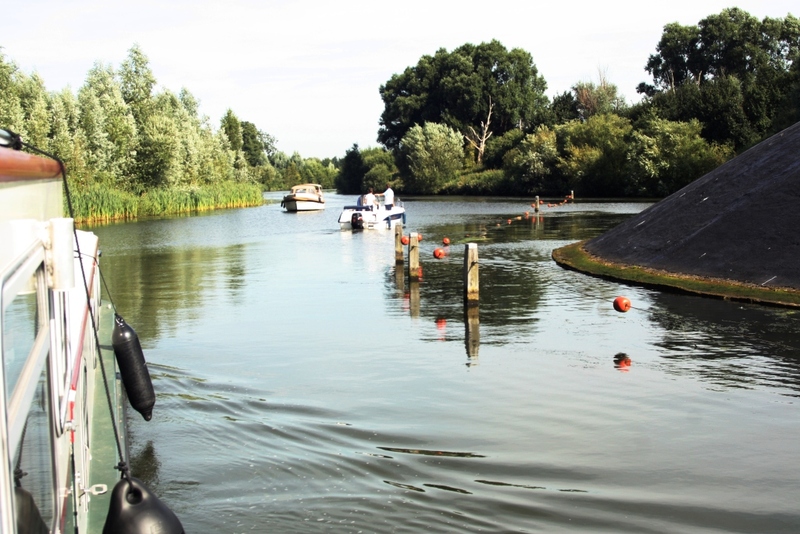 This entry was posted in Accessibility, Waterway life and tagged Boat services, Endellion barge, Netherlands, Restaurants, Travel, Waterway services, Wheelchair access. Bookmark the permalink. Hi Ken and Rhonda, and Harry too. How did Harry manage the trip home? We’re so pleased you are loving your new adventures back in NZ, we’d love to know more about what you are doing. Where are you? If you see our old friend Sam Hunt, please say hello for us! Perhaps he’s in your neighbourhood? Love and best wishes.. keep up those adventures.